Yes, I know. It’s been two months and a day since I last posted on here and that was the belated Happy New Year so I guess you may be wondering what I’ve been up to recently? Well there has been some writing…. it’s just you don’t get to see signs of it. For instance at the end of last year I submitted a 10,000 word book proposal to literary agent in London and it was well received although after a busy weekend or so doing some rewrites the agent decided that they wouldn’t be pursuing the project any further. Now I have to add that that particular project was non-fiction, though if you knew the context you might think otherwise, and I am currently looking at pursuing the project from a different perspective. If I do go ahead with it then you should see some details about it towards the end of April. I have also been working on a website project for the past few months. That is pretty much complete now and will hopefully be finding its feet in due course. Talking of websites that reminds me… AlistairLangston.com will be getting a facelift of its own in due course. I regularly check the website statistics to see where people viewing the site are from, what devices they are using and the content they are looking at and one trend that I have noticed is the increase in use of non-PC devices used to view the website. I therefore think its time that users of mobile devices, tablets and iPads benefit as much as possible from viewing the website on their selected device. Of course you are probably sat there reading this and thinking that’s all very well but when are you going to write another book Alistair? You will therefore be pleased to know that I am currently sketching out a new story at this very moment, details of which I hope to reveal very shortly. Also the three Sam Wilde novels have not been forgotten… they will be coming out this year and that’s a promise. Finally… you might be wondering about the picture at the top of this post…. 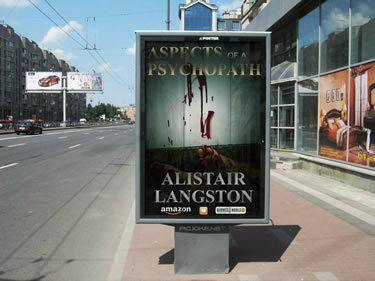 the Aspects of a Psychopath billboard… well one can dream can’t one… I’d love to see a billboard poster with one of my novels on it so I guess I on that note I better get writing again!